This afternoon, the judge in charge of Ayman Nor's forgery case postponed the hearing until Thursday morning. In the courtroom, the prosecution framed his case by asking for key documents such as his birth certificate, his PhD certificate, his Parliamentary membership papers, and his national identity card. Speculation is that they are going to build a case by showing that Ayman has a history of forging documents. Ayman's defense team offered a plea of not guilty. After a 50 minute recess, the judge announced the case would be postponed until Thursday after reading out a list of charges. Pictures from the courthouse today can be found here. This morning we made our way to Cairo South courthouse in near Bab al-Khlaq. We reached the courthouse at 830am. For some of us, this trip was deja vu. It was the same courthouse, courtroom, and judge (Adil Abd al-Salam Guma) that Saad Eddin Ibrahim had in his first trial in 2001 when he was tried for tarnishing Egypt's reputation abroad. But that is where the similarities between Saad and Ayman's cases end. Al-Ghad mobilized loads of its supporters (I am guess around 2000) inside and outside the courthouse. There were orange banners everywhere and people placed stickers that called for "Justice for Ayman" on the many pillars of the once (long ago) beautiful building. Other stickers read "al-Ghad says Kifaya" and "No to Oppression. No to Forgery (or trumped-up) Charges"
We managed to make our way to the closed courtroom door. As the journalists and al-Ghad supporters waited impatiently, it became very crowed and hot. To add to the increasing number of people, there were a sizable contingent of al-Amn al-Markazi deployed to encircle everyone. The unit in charge of crowd control in the holding area (which became known as 'the Sauna') was the same unit (Basateen) as from the Lazoughly protest on Sunday. Around 10am, Ayman arrived and was taken to meet the building's head judges. What happened next remains confusing. Apparently, Ayman wanted to take between 50-100 defense lawyers into the courtroom with him. The judges refused. Ayman came out and addressed his supporters, who were throwing themselves through the security lines to get close to him at the top of the stairs. Ayman was completely inaudible, but the story (at the time) was that he was not going to go to the courtroom. Instead, he was going to file complaints with some ministry. The al-Ghad leadership were conducting interviews with the media and pointing out the injustice. Ayman reportedly called the process "a circus". Then, Ayman disappeared and rumors shot about that he had went to the courtroom through a side door. By this point - most of the journalist had split into several groups. Some were outside with the demos, others were inside with the demos, and the remainder were in the courtroom. It did not look like journalists were going be be allowed accessed early on. In fact, the entire day was extremely poor regarding information flows from the government. I went down and watched the indoor demos. There was some overlap with the Kifaya protests with slogans denouncing the Mubarak family and other top ministers. The most innovative chant had to be "Soldiers are oppressed in the military, eating lentils and dressed in rags." It was an attempt to sway the al-Amn al-Markazi conscripts. They get points for novelty but were unsuccessful in igniting a revolt. After tiring of the demo, I went with a group of journalists and tried to gain entry to the courtroom, which was sealed off by CSF. After several attempts, the head-officer let a bunch of us into the courtroom. Entering the room was odd. It was hot and quiet (compared to the noise outside). It was also packed with people. There had to have been 300 people in a court room that holds 100. The closer you got to the front, you hit a wall of bodies so tightly connected that many strangers shared sweat and body odor. Every time the door to the courtroom opened, you'd hear the protesters chanting anti-regime slogans. In an attempt to get a picture of Ayman in the cage, I tried to push to the front. It was not happening. So I waiting in the back until the proceedings recessed and then pushed with the other photographers hoping to get their one good shot. 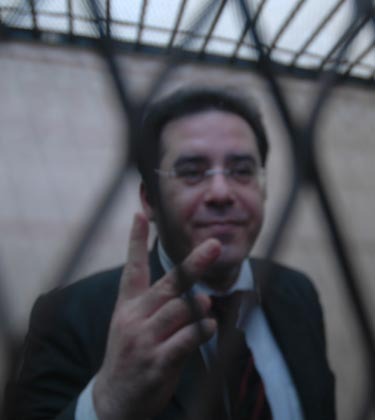 When I got to Ayman, he was smoking a cigar and pacing back and forth in the cage talking to the press. It was so noisy and hot, I could not hear what he was saying. When the trial restarted, I slipped outside to see those demos. They were small outside in the heat. I am guessing 25-people max. The overwhelming thing outside the courtroom was the security forces. There could of been upwards of 70-100 security trucks parked around the area. They seemed everywhere. There were easily 5000 soldiers in the rows and lines in front of the courthouse and down the streets. In fact, in pictures taken from the nearby Anwar hotel, the street was blocked off 1/2km in each direction from the courthouse's entrance. Al-Ghad brought numbers, but Cairo security brought more. Riding back to the island, many of us were tired and drained. The heat, disorganization, and general feeling of being uncomfortable all day had taken its toll. And, today is only the beginning. Saad Eddin Ibrahim's trial was a big deal when it started in 2001. Yet, anyone could show up 5-minutes before the proceedings began and enter without difficulty. True, the courtroom was warm (especially in the summer) but not sizzling because all the bodies trapped together liked sardines. Saad also never had a popular following show up at court like Ayman had today. I guess now we will see if all this support is sustainable.